Notes: Ex-C&O 4168, "Pulling for America"
Title: CSX 6067 "PULLING FOR AMERICA"
Description: CSX GP40-2 6067 "PULLING FOR AMERICA" was built as C&O 4168. Description: Q640 eastbound at Amsterdam. Description: SD70MAC #738 backs up as it breaks down a mixed frieght on the South end of Cayce Yard. Description: A cold night at Pinoca---but worth it to see this power lined up for the night's work. 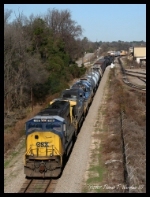 Description: 6067 is between assignments at Augusta, Ga. Description: Coming off the Callahan Subdivision (S-Line) approaching the diamond with the Tallahassee Subdivision (west), Jacksonville Terminal Subdivision (east), and Wildwood Subdivision/"S-Line" (south), 1140 hours. Description: Q594 heads over a concrete bridge in Long Creek, east of Decatur enroute to Indianapolis. Description: This westbound mixed freight crawls into Crafordsville past the semaphores on it's way to Lafayette as the conductor leans out of the firemans side window to give a friendly wave . Note the two diffrent number boards. Description: The second traction motor is burned up on this unit. Description: Shot of the burned up traction motor. Can't see much but it was still smoking some.